Tactical scopes contain an inner tube that is locked securely, using a coil spring positioned within the tactical scope casing, to prevent minor movements after the target has been sighted. Use of the coil positioning system makes the tactical scope easy to lock perfectly on the target for repetitive shots without correcting the scope adjustments. Turrets are clearly marked for repeating a setting in similar conditions on successive days. Sturdy construction means the casing is firmly mounted with strong hardware for virtually any weapon. The tactical scope is resistant to side impact even in the harshest conditions. Lenses are coated with protective film to reduce permanent damage from scratches. High-quality optical crystal is used to construct flawless lenses for the perfect view of an extremely distant target. The scope housing is sealed to prevent humidity penetration that would result in fogging between the lenses. Even when humid conditions create distorting heat waves on the horizon, the tactical scope can bring the target into view for accurate shots every time. 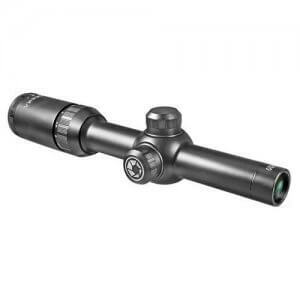 The tactical gun scope provides detailed distance estimates that allow the shooter to adjust the power of the rifle to match the sighted target distance. Military snipers choose tactical scopes to address distant targets while remaining at a safe distance. For recreational hunters, varmints can be spotted at great distances for removal from croplands where they damage cash harvests. Large animals can be sighted over great distances and accurately targeted with the tactical scope. 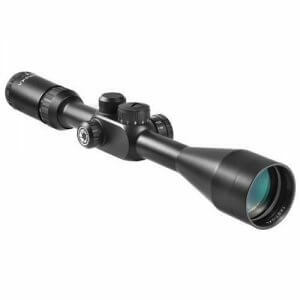 Tactical scopes are designed for long range distances when the target must be kept perfectly centered within the reticle. While turning the turrets to achieve perfect elevation, windage, and focus adjustments, tiny clicks indicate the completion of each minor movement of the scope. Easy movement of the dials allows the shooter to concentrate on adjusting the scope without having to view the dials. The illuminated green Mil-Dot reticle (select models) can be adjusted for daytime use, low-light conditions, and night-time use by changing the color of the dots within the reticle.